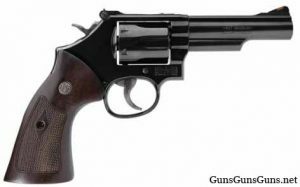 Summary: The description, specs, pricing and photos of the Smith & Wesson Model 19 Classic revolver. The Smith & Wesson (S&W) Model 19 Classic is built on a carbon steel frame and chambered in .357 Magnum (and .38 Special and .38 Special +P, of course). This marks the first time in roughly 18 years S&W has produced this particular K-frame gun. 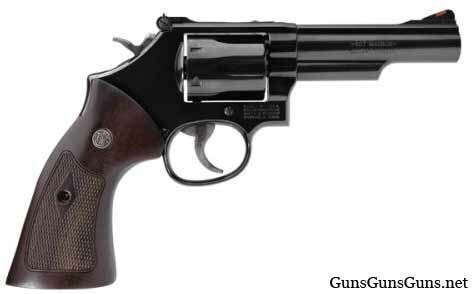 S&W says it includes modern internal components but mimics the look and feel of vintage Model 19 revolvers. The Model 19 Classic from the right. 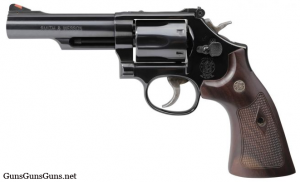 .357 Magnum, .38 Special, .38 Special +P 6 9.9″ 4.25″ n/a n/a 37.2 oz. The Model 19 Classic from the left. This entry was posted in .357 Magnum, .38 Special, .38 Special +P, $751-$1,000, Full size, Revolver, Smith & Wesson on May 25, 2018 by Staff.